Karl Rove, Bill Kristol, Paul Bremer, Elliott Abrams, and other experts speak. The Syrian question is hard in every way -- morally, strategically, practically. Any choice is bad. If the United States doesn't get involved, it countenances horrors. If it does, it could likely make the situation worse. If you're anything like me, when faced with this kind of dilemma your first question is, "What would Karl Rove do?" Or if not him, then L. Paul Bremer, the man who had the vision to disband the Iraqi army soon after the fall of Baghdad and thereby help ensure the Occupation's failure. Or Dan Senor, Bremer's aide and spokesman through this time. 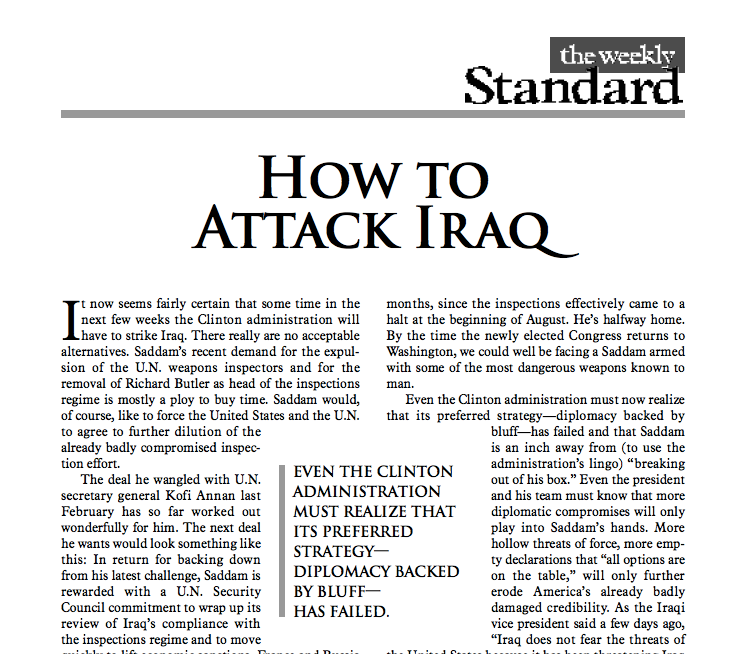 Almost as good would be Bill Kristol, who from the late 1990s onward was urging America to invade Iraq -- that's a 1998 editorial at right -- and, after the realization of that goal, played a central role in bringing Sarah Palin to the public stage. Or perhaps Elliott Abrams, another long-time advocate of invading Iraq, who earlier this year was trying to disqualify now-Secretary, then-nominee and former Senator Chuck Hagel from confirmation at the Pentagon via slurs that he was a bigot. Perhaps you will be surprised to learn that the experts recommend resolute military measures. Or perhaps you won't, since that is what they recommended for Iraq and are still recommending for Iran. Of course these would be controlled, "standoff" uses of force that will work just as planned and will bolster only "vetted moderate elements" of the opposition. Very much as the same experts foresaw the last time they had the stage. I am looking forward to the Standard offering Obama expert advice on speechmaking from Bobby Jindal and Rick Perry, fitness advice from Rush Limbaugh and Chris Christie, and campaign tips from the McCain and Romney teams. I am sorry only that Paul Wolfowitz, Ahmed Chalabi, and Curveball could not be reached for their thoughts before deadline time. Update A reasonable question from a friend: Whose advice would I like to hear? Andrew Bacevich's, for one. And it turns out he has already weighed in. For another, Jim Webb. I'll ask him, but there is this clue from last year. Or Anthony Zinni, whom I will try to locate. Significantly, unlike virtually all of the experts urging "surgical" intervention, these are people who have fought in wars themselves or been responsible for their aftermath. Perhaps Robert Gates too -- and now that I look, I see how he is leaning. Or James Mattis -- and, as it turns out, his instincts are the same. Also Gary Hart, who has just written in a similar vein, for instance: "The use of force is not a policy; it is a substitute for policy." So: the men who gave us Iraq on one hand, the people who were against it or far more cautious on the other. Let's give the tie-breaking vote to Dwight Eisenhower, from up in heaven. One guess about what he would recommend.